A South Asian regional training of trainers course on the use of the ‘Learning To Live Together’ manual for ethics and peace education will be hosted by the Sarvodaya Movement, at the Vishwanikethan International Peace Centre, Rawatawatte, Moratuwa from the 13th to 18th of August, 2011. Peace educators and activists from Afghanistan, Bangladesh, India, Nepal, Myanmar, Pakistan and Sri Lanka will take part in this course supported by the inter-faith network, Global Network of Religions for Children (GNRC). The course centers on the use of the Learning To Live Together manual for Ethics Education for Children developed by Arigatou International in collaboration with UNICEF and UNESCO. “With many of the South Asian countries either in the midst of or having recently faced violent conflict, the relevance of peace education is very high in the region. In order to transform South Asia in to a zone of peace, hope for the future lies with our younger generations and peace education is a vital investment we must make in this regard” says Dr.Vinya Ariyaratne, GNRC’s Regional Coordinator for South Asia and General Secretary of the Sarvodaya Movement. Learning to Live Together is a resource material to nurture ethical values needed to learn to live together in plural societies. It tackles peace education through intercultural and interfaith learning to help communities and societies live peacefully together, with respect of the other and dignity for all human beings. Giving focus to the key values of Empathy, Respect, Responsibility and Reconciliation the manual highlights dynamic methodologies to engage young people along with collection of valuable resources and tools for ethics education. 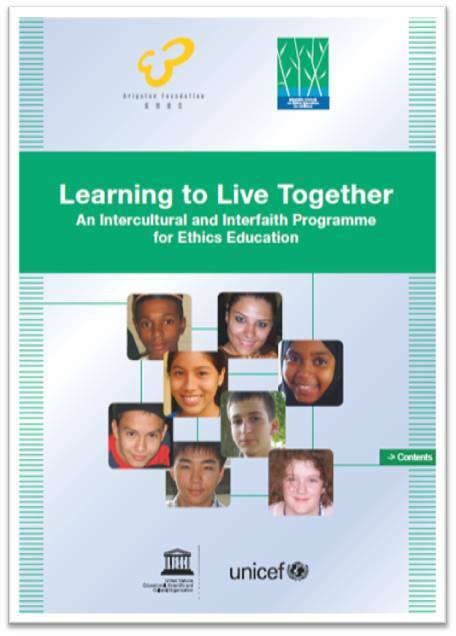 Learning to Live Together provides youth leaders and educators worldwide with the tools for an intercultural and interfaith programme, by which children and young people are able to develop a stronger sense of ethics. It is designed to help the young understand and respect people from other cultures and religions and to nurture their sense of belonging to a common humanity.